Great costumes are important - but without the right accessories, a costume can easily fall flat. Such is often the case with costumes that don't utilize makeup to apply the finishing touches. Take, for instance, a clown costume. Without the white face makeup needed to transform the guy wearing a red nose into a real clown, you're looking at a costume that doesn't do much in the excitement department. Say you're looking into a Zombie costume for next Halloween - what's a zombie without a little bit of fake blood? We've rounded up a few tutorials for you on how to apply your Halloween makeup, plus, we've highlighted below some our best sellers in the Halloween makeup department. 1) Black Beaded False Eyelashes - a pair of falsies are perhaps the most underrated makeup accessory around. Perfect for any witch costume, as well as anything that requires a little bit of extra oomph. Whether you're mimicking the Wicked Witch of the West or a famous pop star, you're going to want a pair of false eyelashes. 2) White Clown Makeup - no clown look is complete without this white base. This white cream foundation is a must have for any clown costume. 3) Custom Vampire Fangs - Need we even say it? Thanks to Twilight, True Blood and Vampire Diaries, vampires have been all the rage when it comes to Halloween costumes over the past few years. Of course, no vampire costume is complete without a set of fangs. You'll need these to scare off the werewolves, you know. 4) Hollywood Gel Blood - No Zombie costume (heck, no scary costume!) is complete without a whole lot of fake blood. Ever wonder how they make the blood you see on screen in the theaters? The stuff that looks so real you can almost taste the metallic zing in your mouth when you see it on screen? It's this stuff. Of course, it's not the real thing (that would be REALLY scary), but it sure looks close to it. 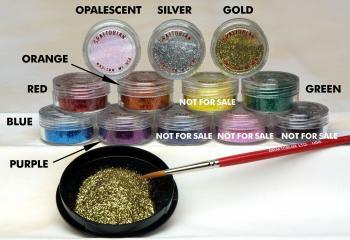 5) Face Painting Glitter - Let's face it - no fairy costume is complete without a little bit of fairy dust, or as we mere mortals call it, glitter! If your little girl is going as any sort of fairy or princess this Halloween, you're going to need to douse her in glitter. This fabulous sparkly material is a favorite in arts and crafts projects, but it's also great for painted faces on the holidays. For more great makeup and props for your Halloween costume, click here!